Like most stains, ketchup and catsup stains will be more easily removed if they are fresh. Even if the stain has been forgotten until laundry day, you can still get rid of it. We'll walk you through the steps you need, be sure to read through everything before you begin. One wrong move can set the stain and potentially ruin your clothes. The key to successfully salvaging your favorite shirt or pants is patience and using the right cleaner for the fabric. You also don't want to dry the clothing until you're sure the stain's gone. Tomato-based stains are notoriously stubborn, so this may take awhile, but it is a relatively simple process. Most of the things you'll need to remove a ketchup stain may already be in your laundry room or kitchen. You have a few options for strain removers and things like vinegar, hydrogen peroxide, or dish soap may work better than a commercial stain remover. However, some ketchup stains, especially if it's dry, will require a combination of cleaning agents. Remove as much of the excess ketchup from the fabric as possible. Use a spoon or the back of a butter knife. This won't damage your clothing, but it will get all the solid material off the fabric. It's really important to get this off, even if it is dried on. The next step will cause any excess ketchup to smear and expand the stained area. Run cold water through the back of the stain as quickly as possible. This will force the stain back out through the fabric. Don't run it through the front of the stain, which will only push it deeper into your clothing. Cold water is really important because hot water will set this tomato-based stain. Rub a liquid laundry detergent into the stained portion of the fabric. Gently work it into the fabric in a circular motion, beginning on the outside of the stained area and working in. This will minimize the spreading of the stain. Liquid laundry detergent also removes some of the oily parts of the stain. Mild dish soap can also help remove the oil. If the garment is white, or you have tested it for colorfastness, apply a mild bleaching agent. Your best options are hydrogen peroxide or white vinegar applied with a sponge. You can also use lemon juice on white fabrics. Be sure to use only one bleaching agent at a time. Rinse any cleaner out completely before trying a new one on the stained area. Repeat with detergent followed by a mild bleaching agent until the stain no longer appears. Hold the stain up to the light to make sure all of the ketchup is gone. If you see any hint of brown or pink, repeat the previous steps. Ketchup is notorious for seeming as if it's gone, but when it's dry, a faint hint of the stain may remain. Apply a stain remover stick, gel, or spray. Allow it to sit for at least 5 minutes. Wash normally with detergent. Before drying, double-check the stain. Stains that are dried will often be permanent. If the stain remains, then you should rub detergent into the ketchup stain. Next, soak it in warm water for 30 minutes, then rinse well. 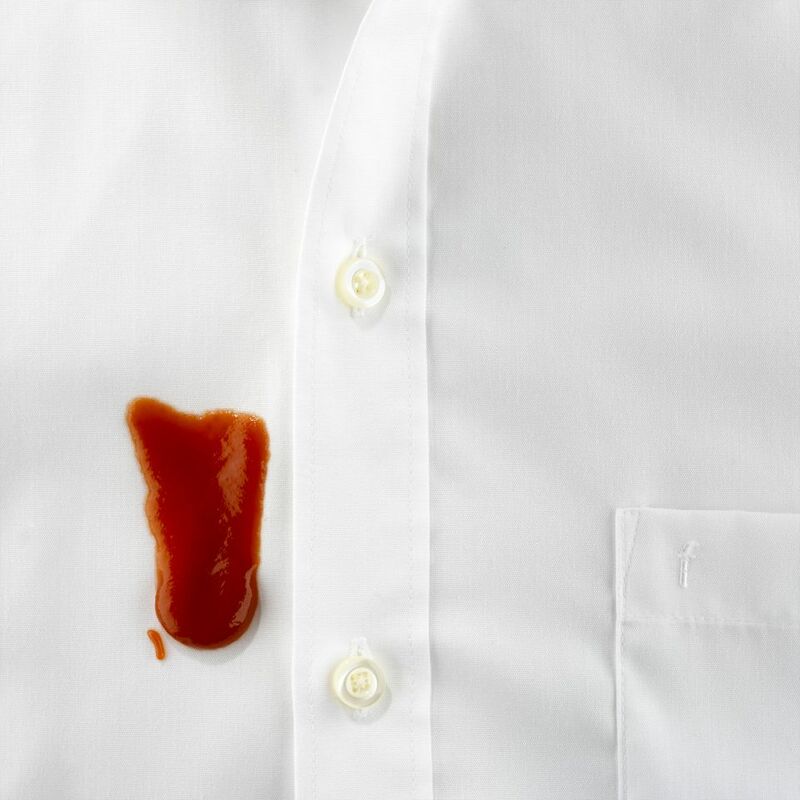 If the ketchup stain is still stubborn, apply a stain remover stick, gel, or spray and launder according to directions. Do this step even if you can't see any lingering stain, to be sure all traces of the ketchup stain are gone. Allow the clothing to air dry because a machine dryer will set any stain that remains.